Happy Friday! I hope y'all have had a great week! I've had a good week but an exhausting one. My husband had to travel out of state for work this week and sometimes I don't realize just how much he does around the house until he's not here to do it! I will be very happy to have him back home today and so will the girls. It just isn't the same around here without him! Today, I'm sharing my weekly roundup of what I'm currently loving. Y'all, I'm not even sure what season it is. I feel like it's been a combination of almost every single season just this week here in North Carolina. We've had bitter winter at the beginning of the week, a mild fall and rainy spring. Layers is just the answer right now because you just never know what season we might be doing! It literally changes every single day around here! 1. H E E L S | Pink heels just make every outfit more fun. I have a pink pair of heels already but I am really loving this option. This shade of pink is so pretty! 2. H E A D B A N D | This headband was an impulse purchase of mine this week. My search for cushion covers lead me to H&M (I had no idea they sold home decor items). 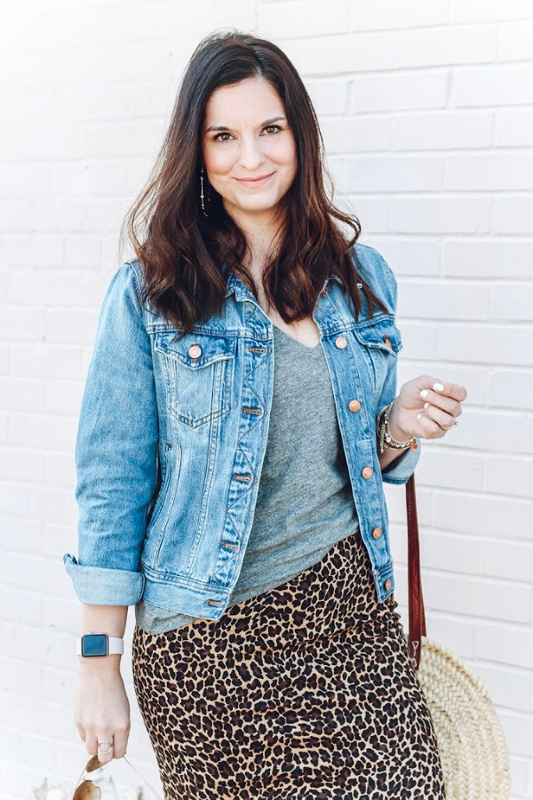 This adorable and budget friendly leopard headband just kind of leaped into my shopping cart! 3. P A N T S | I shared six ways to style these around $23 pants here on the blog this week in this post. I just think they are the most fun pant to wear now and later! The fit is true to size. 4. S W E A T E R | How many cream sweaters is too many?! I think I already have three but I love this one for wearing into spring. It's such a classic, closet staple! 5. T O P | I love the colors of this top! It's such a cute top that's perfect for your everyday mom uniform. I would pair this with a pair of skinny jeans, sneakers, and a baseball cap! 6. J A C K E T | The one kind of denim jacket that is missing from my closet is a boyfriend denim jacket! I love this slightly distressed option. Adding to my closet ASAP! 7. R I N G | I already own and love this ring. I love how it simply makes a statement! It comes in rose gold, silver, and yellow gold. 8. T O T E | Like I said last week, sometimes I share items again here for what I'm currently loving because when I own it and love it, I want to let y'all know! This bag was featured a few months ago and I absolutely love it. It even made my top five purchases for 2018! See all of my favorite buys from last year in this post.